1 Preheat the grill to high. Mix the chopped mint, oregano, garlic, oil and vinegar with the chicken, and season. Thread onto 4 metal skewers, alternating with onion wedges. 2 Grill the chicken for 20 minutes, turning regularly, until cooked through and golden with no pink meat. 3 Toss the cucumber with the rest of the mint, the yogurt and some seasoning. Heat the flatbreads under the grill. 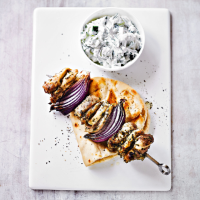 Open out and serve with the souvlaki and the cucumber salad.